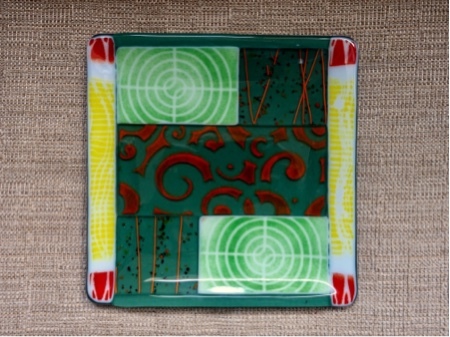 Well here is the finished product of my patchwork 8” square slumped dish. 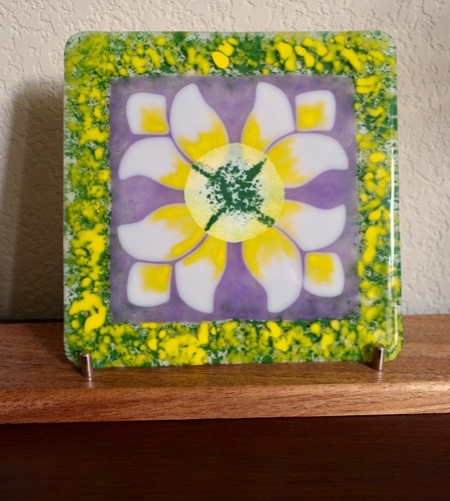 This was created by making part sheets with glass powders sifted over stencils and found objects. 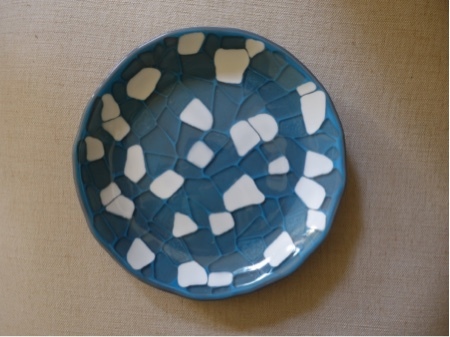 The individual pieces are full fused then cut up and arranged to fit the square dish mold and then slumped. The designed part sheets are only one layer of 3mm glass, either clear or white opal. There is some waste as you have to trim off the edges of the part sheets where they shrink in and get a bit thicker then the center. Its not completely a waste as you can make frit or use pieces for jewelry etc. Here is one more piece I recently completed. This bowl utilized a lot of scrap clear glass left over from cutting out large clear circles. The base piece was an opal piece of gray glass. Next I cut up the scrap clear glass into random sized pieces. Next I shifted Light Cyan 216 bulleye powder over the base gray piece and gently placed the clear scraps all over the powder layer. I made one slight mistake when putting this together. I picked up all the clear scrap pieces and set them in the bowl mold. Unknowingly the pieces got contaminated with kiln wash powder left on the mold.....darn. Won’t do that again. So when it was full fused some of the kiln powder showed up in the clear spaces between the layers of glass. Not all but some. I liked the piece so thought hard.....what can i do to save it? I got out my ColorLine paints and carefully added white to the most noticable areas where the kiln powder showed up. I also added some of the cyan glass powder to other areas less noticable and did a second full fuse. Turned out very acceptable and it turned out to be a more interesting piece. Sometimes glass is more forgiving than you think, so don’t give up to soon if something goes wrong. Both of these pieces are good examples of designing with scrap glass. I dont have a lot of room for storing a lot of scrap so I try to use it up as it accumulates. Sometimes it gets your creative juices going figuring out ....”what can I do with those scraps”. Hope you all had a great Thanksgiving. 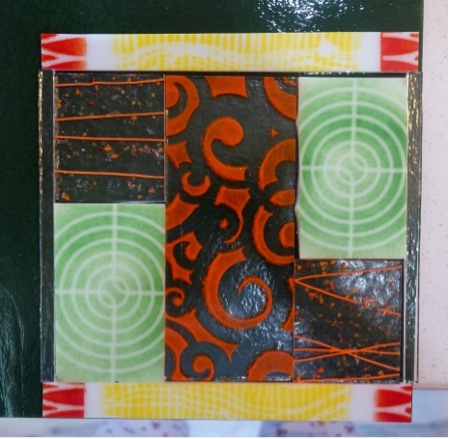 I was excited to get back to glass fusing after all the cooking and house cleaning. I just recently bought 2 new ebooks. One is Lena Beckeus’ Fusing Techniques with Powder and Fiber Paper. The other one is INTRODUCTION TO KILNFORMED GLASS POWDERS Basic Crackle Texture, Micro and Backed Wafers by Bob Leatherbarrow. Im just starting to experiment with some of the techniques in these books. The photos above are my first attemp at the basic crackle technique. I used two colors, Olive Green and Woodland Brown for my powder layers. This was done on clear 3mm glass. One layer only of glass. After layering 3 layers of powder and spritzing with water I carefully placed a stencil on top and sifted woodland brown to create the pattern of squares. After full fusing it was slumped into a small sushi plate. I was quite happy with first attempt and am excited to do more. The next set of photos was a piece I did before Thanksgiving. I wasnt to happy with it so decided to keep working on it. The border was just the dark green sponged on with enamal paint which I didn’t care for and the center had a small dark green square that I also didn’t like. So I sponged on the yellow paint on the top giving the border depth of layers. 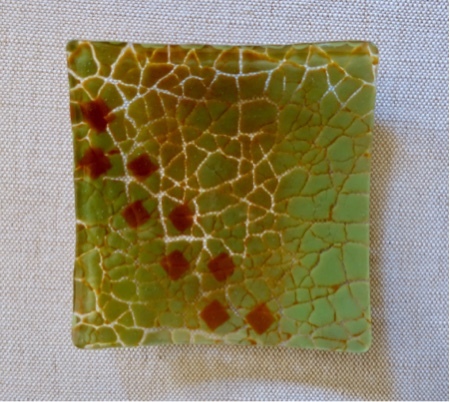 Then I had made some glass wafers by fusing glass powder directly on a kiln shelf as instructed in Leatherborrow’s book. 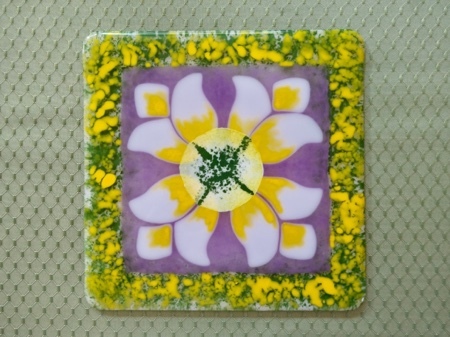 I used a circle whole punch to make a circle stencil and sifted yellow and white powders and fused. I then decided to try placing the wafer over the center area I did not like. I thought it still needed some green in the center to repeat the green somewhere else. I used my enamal paints on top of the wafer. I wish I would have also used some of the yellow paint in the center too. I full fused this piece a second time. The wafer fused in nicely but has a slightly rougher texture when you run your hand across it. 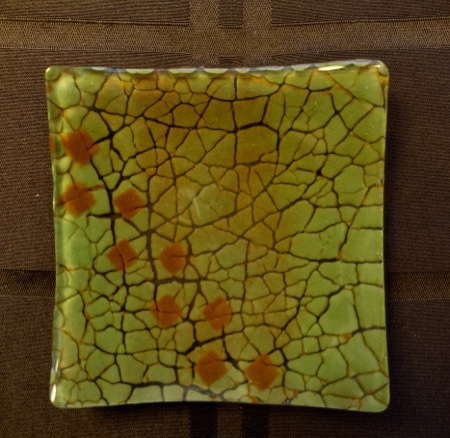 Its probably from the kiln paper powder that remained on that side when I flipped it over. Next time I will carefully place the wafer in water to remove all the excess powder and let dry before using it on a project. But overall I am very excited about these two techniques and am looking forward to improving my use of them. Right now I have a piece in the works using up some part sheets I made awhile back. I cut off the thick edges and chopped them up into usable pieces to make a patch work piece. Some pieces have transprent backgrounds and some opal. I’m going to place them on a darker green opal base piece. Here is a photo of just the rough pieces layed out. My next blog will show results.